I am a summer person... I may have said this before, but I am totally all about hot weather and shorts. But, I am totally inspired by fall food! Pumpkin and spice cupcakes really hit the spot. 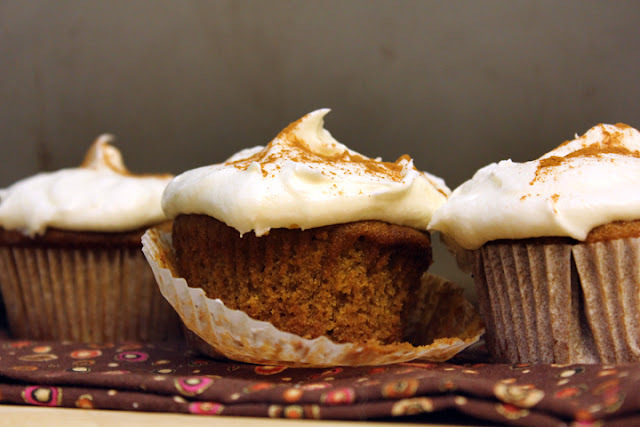 Smothered in cream cheese frosting, and dusted with cinnamon, these didn't last long. And, like a fool, I gave away the few left overs. Shame on me! Whisk flour, baking soda, baking powder, salt, and spices together in a large bowl. In another bowl, cream butter and sugars, add eggs and mix till smooth. Add dry ingredients and mix until smooth. Whisk in pumpkin puree until well blended. Don't worry about getting rid of all the lumps. The batter is pretty thick. Fill cupcake liners until about 3/4 of the way full. I like to use an ice cream scoop to help keep cupcakes an even size. (It also keeps things cleaner. And I use this for making cookies so they are all the same size.) Bake about 20 minutes or until a tooth pick inserted in the middle comes out clean. Cool on a wire rack. Let these cool completely before you frost! Makes about 3 cups of frosting - I dolloped a ton of frosting on 14 cupcakes and had tons of left overs. This amount of frosting would easily frost a two layer cake. Whip softened butter and cream cheese together until smooth and fluffy. Start with 2 cups of powdered sugar, and whisk in remaining sugar until the frosting is the consistency you want. You may need a little more, or a little less. Whisk in maple syrup. Chill for a few minutes and dollop onto cupcakes. Dust lightly with cinnamon. Melt butter in a wide bow. Mix sugar and cinnamon on a small plate. While mini-muffins are still hot, roll them in butter and then roll them in cinnamon sugar. Cool a bit and re-roll in cinnamon sugar.